CHENNAI: In what could tell a tale on quality of engineering education in the state, at least one among every three students enrolled in engineering courses has arrears at the end of the course period. According to the statistics released by the All India Council for Technical Education, out of the 1.57 lakh undergraduate students who passed out in the last academic year (May 2016) from various branches of engineering and diploma courses, 48,139 had arrears. This means more than 30 per cent of the students did not complete the course within the 4 years time period. Going by the data, the scenario is worse when it comes to masters-level engineering and diploma courses. 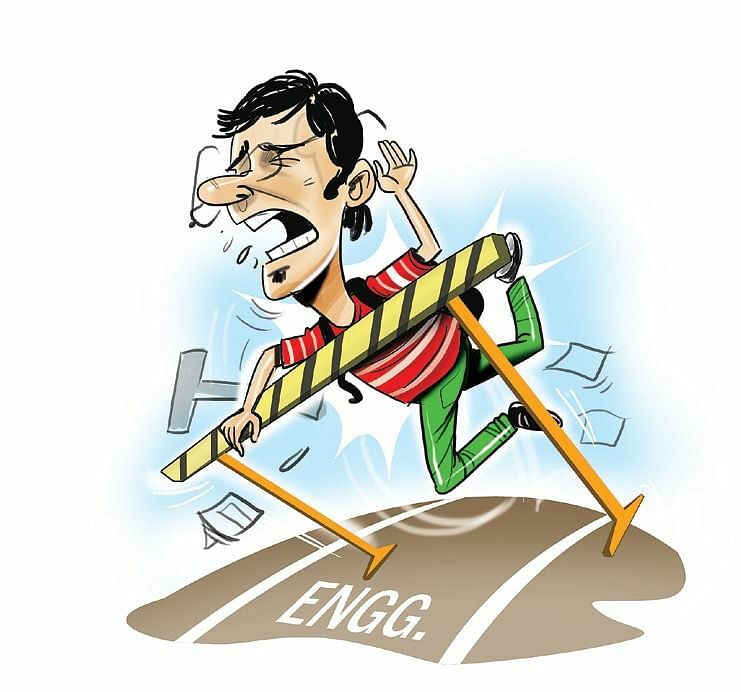 More than 40 per cent of students studying post-graduate engineering and diploma did not complete their course this May. This amounts to a whopping 95,000 students. It is not just the last academic year. This trend of poor performance has existed since 2012-13. In 2012-13, more than 39 per cent of undergraduates had arrears at the end of four years. The figure stood over 30 per cent in 2013-14. In the academic year 2014-15 alone, the numbers dropped significantly to 19.27 per cent. This, however, was rapidly reversed this year as the number of unsuccessful students saw a rise of more than 10 per cent. Among the streams, it is the civil and mechanical engineering, which has the highest percentage of students failing to complete the course. In the last academic year, 44.29 per cent of civil engineering students had arrears; so did 41.39 per cent of mechanical engineering students. The Electronics and Communications Engineering stream, the most preferred course among toppers, had the least number of unsuccessful students - 17.6 percent. So, what ails Tamil Nadu’s engineering colleges? It is the sheer number of colleges that have sprung up in every nook and cranny of the state, say experts. “The mushrooming of private colleges has brought down the intake quality,” says former Anna University Vice-Chancellor, P Mannar Jawahar. “Students with much lower cutoff marks have managed to study engineering due to this,” he says. “Not all engineering students are genuinely interested. They join due to parent’s pressure,” says M Raj, an associate professor at a private college in Tirupur. But a few student blame it on the teachers. “All we managed to do is learn the set of important questions marked to us the previous day and repeat them in the internal exams,” said D Arun, an engineering student from Erode. Since the same cannot be repeated in university exams, the students find it difficult to clear the paper, he says.